 Cut and process wheat straw in one pass.  Finely broken high density straw - ideal for animal feed.  Crops harvested: wheat, barley, rice, ameranthus, lentils, etc.  Processed straw and Clean grain is collected in bags for ease of handling.  Can be transported within the width of the tractor, ideal on narrow lanes, etc. 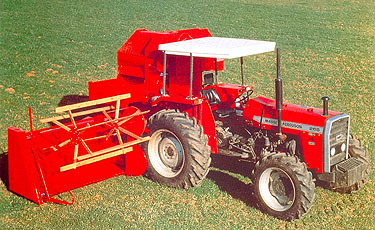  Tractor mounted or drawn, and designed for easy maintenance.  No baler and straw shredder are needed.  All these savings with a price of 1/10 of a Combine Harvester.  Can be used for stationary threshing - versatility which provides maximum return on investment. © 2002 MacAntar Engineering Ltd.